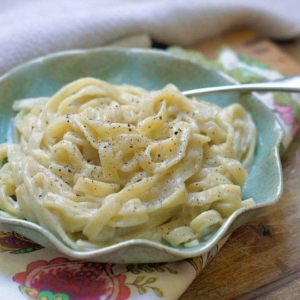 A creamy, dairy-free sauce that's perfect over noodles or vegetables! Saute the minced garlic in the coconut oil or butter in a small saucepan over low heat. Allow to cook for a few minutes, until the garlic is tender and fragrant, but not browned. Add the 1 cup of water to the saucepan, along with the cauliflower, and bring the water to a boil. (The water will not cover the cauliflower, and that's okay.) Once the water is boiling, reduce the heat to a simmer and cover the pot for 8-10 minutes, until the cauliflower is fork-tender and very soft. Season with additional salt and pepper, if desired, and serve hot. Keep in mind that this sauce will need additional salt if served over plain pasta or steamed vegetables, as the flavor will get diluted. If you plan on adding another salt source, such as Parmesan cheese, the additional salt may not be necessary.